Dr. Seuss�s zany thinks created a trove of books that inspired generations of children to learn to read, while also inspiring this fun and engaging musical by Stephen Flaherty and Lynn Ahrens (Ragtime, Once On This Island). 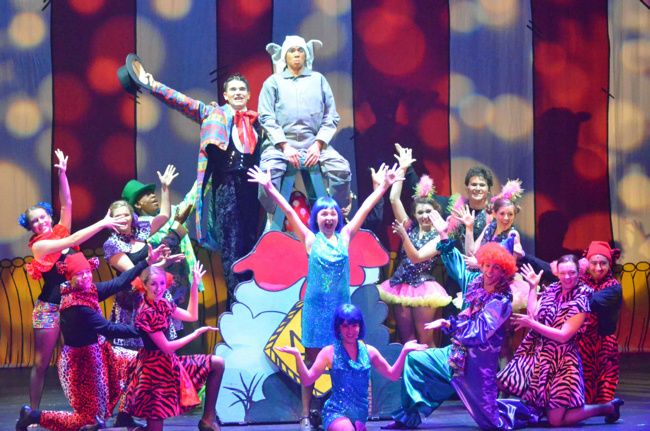 The story is based on Horton Hears a Who and Horton Hatches an Egg, intertwined with gazoogles of other Seuss books and characters, all as seen through the eyes of a young reader who gets named JoJo and our narrating Cat in the Hat who wears many hats throughout the show. It starts with Horton hearing voices, but are they real voices or does he just think he hears them? The lives of all the Whos down in Whoville depend on him believing in them and protecting them, as their precarious existence on a tiny speck of dust grows more precarious by the moment when the other animals of the Jungle of Nool decide Horton is nuts and that his precious speck has got to go. Will Horton risk everything to save these tiny people only he can hear and nobody can see? The loyalty of Horton and the imagination of a young daydreamer named JoJo may hold the key as the lives of the Whos hang in the balance, hovering just inches above a hot, steamy kettle of beezlenut oil. 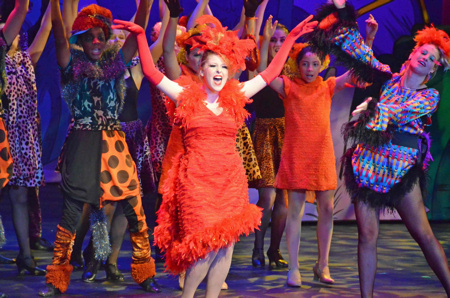 Valley Youth Theatre returns to Seuss at the Herberger in downtown Phoenix with another lavish production. 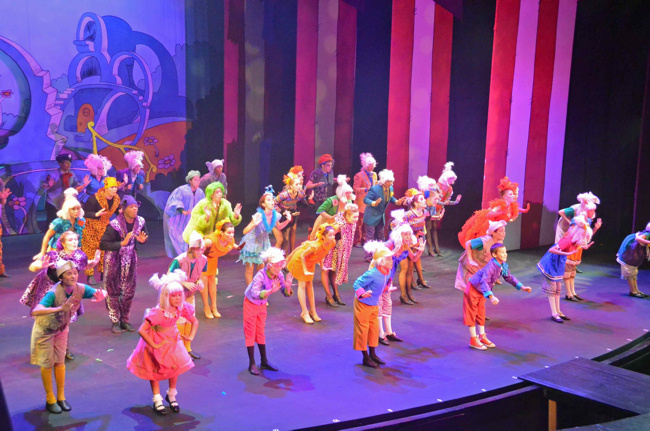 Director Bobb Cooper and his team keep things lively and colorful, including some nice lighting by Mike Eddy and elaborate costumes by Karol Cooper that help bring the exotically iconic characters of Dr. Seuss from the page to the stage. 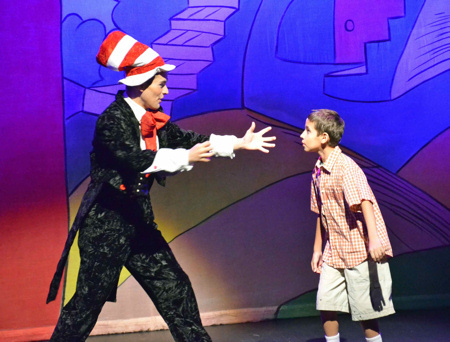 Directing things from the stage itself is Philip Amerine as the Cat in the Hat who messes with game-for-adventure young Jojo (Vincent Jacovo), messes with the audience including spraying them with his tears, and impersonates a doctor aided by an amusing nurse and intimidated by a demanding patient. The latter is Payton Bioletto as an endearing Gertrude McFuzz who desperately wants to catch an elephant�s eye, and details some of her more dramatic efforts to do so with her amusingly performed For You. John Batchan transmutates from the Donkey in VYTs Shrek a couple months before into Horton the Elephant, his great expressions and demeanor working throughout as he stands by the vulnerable whos. Terrific talents from throughout the valley fill the cast. Cameron Benton, Dani Burley, and Carly Makani Copp lead us all through the story as narrating Bird Girls with dynamic dancing and flair. Ally Lansdowne is a big hit with a huge personality as the vainly amazing Mayzie. General Schmitz (Tim Oakes) is hilarious as he tries to keep his little troops in line and motivated for the war against butter-side-downers. Grecia Magdaleno has big vocals and big sass as the Sour Kangaroo always backed up with more sass by Baby Kangaroo Aurelie Wisdom. As Judge Yertle the Turtle, Adam Hays lays down the law with iron-fisted comedy. Connor Baker, Ben Massouras, and Mason Reeves make for great bad boys as they intimidate poor Horton, and the rest of the jungle animals of Nool are saucy and fun. Mr. and Mrs. Mayor Jenson Metcalf and Caroline Noonan lead their fellow whos through their nerve-wracking existence on a speck of dust in several amusing numbers and, with Horton and Jojo, in a mesmerizing Solla Sollew. And they all join together to close the story, and hopefully inspire new ones, with Seuss�s Oh The Thinks You Can Think.